We all know that in today`s day and age finding a reliable, educated trainer that can help you reach your fitness goals is rare. Your search is over. Look no further than Coach Rick Saggese and Think Outside the Diamond Sports Performance & Fitness (TOTDSP). Rick has been helping people crush their fitness goals and drop inches off their waist since 2000. 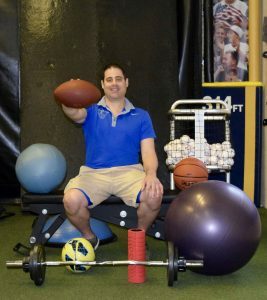 Unlike most other trainers, Coach Rick is not looking to over charge and under deliver. When you entrust Rick with improving your lifestyle, you will not be disappointed. There are three key reasons why Think Outside the Diamond is the place to be and Rick Saggese is the man to see. Think Outside The Diamond is the place to be to knock your fitness goals out of the park is because Coach Saggese provides a warm, friendly and personalized environment where you will be pushed to your limits. The majority of the people that are looking to get in shape usually begin by joining a box gym and often times that is their first and most dreadful mistake. Box gyms are the place for the workout junkie, the body builder who knows how to train properly. For a first time gym goer or for someone who might be lacking self-confidence joining a box gym is not the right move. That is where TOTDSP comes in. TOTDSP is not a box gym, it is your gym. When you train at Think Outside The Diamond you are entering a first class fitness performance studio. Rick and his staff work hard to ensure you are not treated as just another heartbeat paying for a membership. From the moment you step into Naples finest training and performance studio, you will be able to call it your home. TOTDSP is where you need to be to see the results you want, is because Rick and his staff will provide you with all the necessary tools for you to be successful. When you make the choice to begin training at TOTDSP, you are one step closer to becoming a healthier you. Your first session with Coach Rick will consist of a fitness assessment test. The results yielded on this test will provide the training staff at TOTDSP with the information they need to begin to build your personalized training and nutrition performance guide. Not only will training at TOTDSP provide you with a personalized training environment, it will also provide you with the staff that will make sure you are performing the correct exercises along with eating the correct diet to be successful. Finally, TOTDSP is the place to be and Coach Rick is the man to see is because you will not be along in throughout what can be a very intimidating process. Rick Saggese is not just a fitness guru that happens to be a personal trainer. He is a passionate man what truly cares about you achieving your goals. Rick will not only be there to push you to reach your fitness goals but, he will also be right by your side every step of the way for encouragement and to help you regain your self-confidence. Now take the initiative and become a member of the #totdfamily and train at a studio where you are cared for and valued.